Netvibes recently analyzed this question using Dashboard Intelligence. Watch the webinar video below and keep reading to discover some of the insights we found. 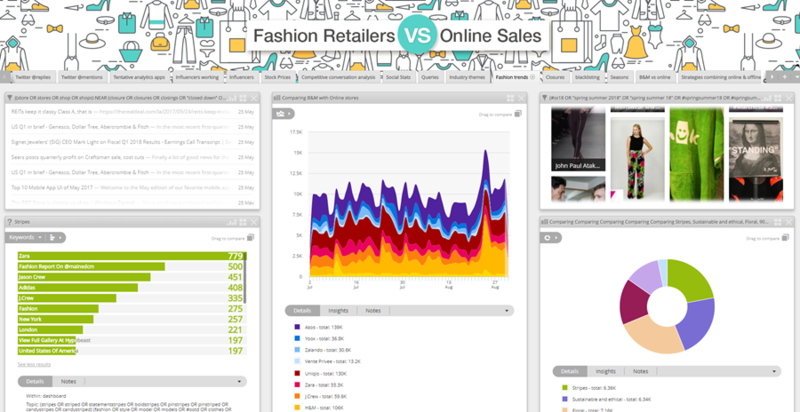 For this analysis, the dashboard focused on “fast fashion” brands, including: Asos, YOOX Net-a-Porter, Zalando, Vente Privee, H&M, Uniqlo, Zara, J.Crew and Abercrombie & Fitch. What have been the effects of the rise in online sales? Using data from Credit Suisse, we observed a general increase in physical store closures, especially in 2017 (projected). As a store owner, let’s say we want to track this pattern and understand why store closures are happening. Using Netvibes Potions, we set up a custom alert that will send us a Pushmail report automatically via email whenever store closure mentions have increased 20% in the last day. How have the gross revenue and profit figures changed for fashion retailers? Using the dashboard we looked at publicly available data to analyze retailers’ revenues over time. US clothing sales have been flattening off since mid-2015. Online retail is experiencing double-digit growth (versus single digits for brick-and-mortar). Top fast fashion brands are still growing, but losing market share to online retailers. For example, H&M’s overall revenues have gone up between 2012-2016. However, H&M’s Share of Revenue is down (likely as a result of online retailers grabbing a larger slice of the pie). Using predictive analytics, the Netvibes dashboard projects that fast-growing revenues of Yoox Net-a-porter and Asos (online retailers) will equal or surpass revenues of J.Crew and Abercrombie & Fitch (traditional retailers) in 2018. What are the expectations in online versus offline customer experience? Importance of the customer experience: How an organization delivers to its customers is becoming more important than what it delivers. Customers care greatly about service, support and logistics abilities, while clothing quality is taking a backseat. Future outlook: What is expected in the future is a continuous retail experience: “everywhere-commerce”. Recommendation: Physical stores should celebrate the physical environment and use it to offer surprising new experiences to consumers by using AI, VR, AR, Facial Recognition, and other emerging technologies. Recommendation: Personalize the experience by using both online and offline customer activity and improving the experience of both venues. We also used the Netvibes Dashboard to analyze and predict market trends. What are the hottest upcoming fashion trends? To learn more about our analysis of Fast Fashion Retailers and to see more charts, please watch the video. Ready to explore how Dashboard Intelligence can deliver the real-time insights you need to drive your business forward?